The Schlumberger brothers were the first to use the direct current (DC) resistivity method for exploration in oil well boreholes in Russia during the 1920’s. A unique phenomenon, now referred to as induced polarization (IP) chargeability, was noticed at the time, but not understood until simultaneous developments in both Russia and North America in the 1950’s. This led to the development of the time domain and frequency domain IP methods. Combined DCIP surveys have become mainstays in mineral exploration, with the two measurements (resistivity and chargeability) both being recorded at the same time using the same equipment. DCIP was briefly used in the late 1970’s and early 1980’s for hydrocarbon exploration using very large truck-mounted generator/transmitter combinations and large receiver dipoles, but with limited success (Seigel et al, 2007). DCIP recording systems went through a significant advance when digital distributed array technologies developed for seismic were adopted. In addition to facilitating large scale, high resolution DCIP surveys in both 2D and 3D, these new systems opened the door to passively recording naturally occurring EM signals, a method called magnetotellurics (MT). MT is a natural-source electromagnetic (EM) method. The mathematical groundwork was developed virtually simultaneously in Russia, Japan and France by Tikhonov, Rikitake and Cagniard respectively (Chave and Jones, 2012). Commercial use of MT occurred in the late 1950’s in the USA, primarily for geothermal exploration (reservoir sealing, high-conductivity, impermeable clay layers at depth); in Russia in the 1970’s for hydrocarbon exploration (wildcat exploration in difficult terrain), and in North American and African mineral exploration (initially for diamonds to define the base of the craton, now routinely for defining mineralizing systems from surface to depth). Modern recording systems such as Quantec’s TITAN 24 (2D) and ORION 3D routinely record DCIP and MT all in one survey. Typically, the DCIP is recorded during the day as active crew involvement is required to perform current injections, and the MT is recorded passively during the night when the naturally occurring signals are the strongest. DCIP can provide a relatively high-resolution model to a depth of around 700 m, with the MT model starting at approximately 500 m depth and extending down to several km, with depth being dependent on acquisition geometry. This article will focus on the MT method, but as MT data are often recorded along with DCIP data, the latter will be mentioned in case study results when relevant. Typical resistivity ranges for various minerals and rock types are illustrated. Rob Hearst, Chief Geophysicist: P.Geo., B.Sc., M.Sc. has many years of project management experience in exploration geophysics. Having obtained his HB.Sc. (Geophysics with Geology specialization) from UWO in 1983, he commenced work with Paterson, Grant & Watson Ltd. (PGW) as a geophysical consultant. In 1993 he obtained an M.Sc. (Geology and Geophysics) from McMaster University. During the ensuing years, Robert has held many roles, technical and management, both as a consultant and as Chief Geophysicist at McPhar Airborne Survey, President and Chief Geophysicist at MPX Airborne Surveys, Manager Interpretation at Quantec Geoscience, Chief Geophysicist for Asperbras, Chief Geophysicist for Areva Resources Canada Inc., and is currently Chief Geophysicist at Quantec Geoscience Ltd. He has worked on the ground in North America, West and Central Africa, the Middle East, China and India in all aspects of geophysical program design, acquisition technologies, interpretation, data integration and research and development. 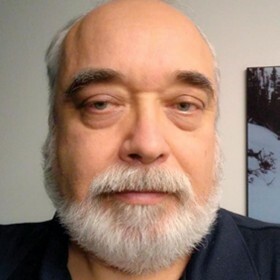 Rob is a member of the PDAC, SEG, CSEG, ASEG, EAGE and KEGS (past President) and is a registered Professional Geophysicist with APGO, APEGS, APEGA and NAPEG.